I recently parted ways with my Canon 60D DSLR, 50mm 1.4mm and 18-200mm lenses. It was a hard decision to make - but necessary to move on to something new. I have spent the past 6+ years in love with photography and have taught myself so much along the way. Back when I used to maintain this blog on a regular basis I was out and about with my DSLR every weekend, snapping everything in sight. As the years have gone on and my interests have changed, I rarely used my camera. It sat on the shelf and gathered dust. Lugging around a heavy camera and a collection of lenses became burdensome and then having to download, edit and upload through my computer became just another annoyance. It became clear that I needed to make a change. I did my research and landed on something completely different than what I'm used to! 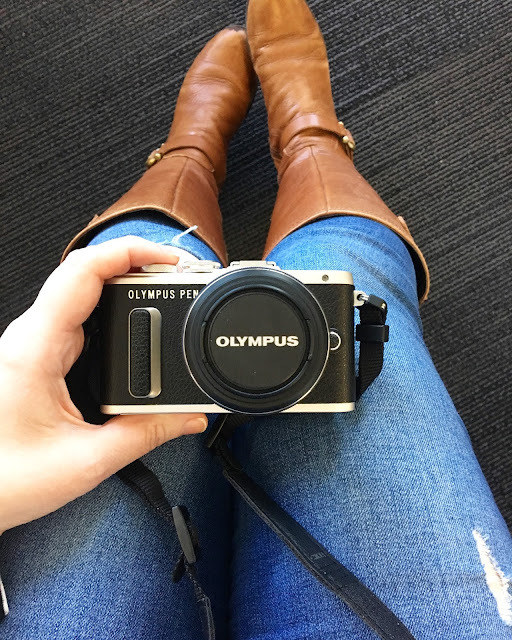 An Olympus Pen E-PL8. It's mirrorless, small and has a retro look. It has the capability for different lenses, so I can always add more down the road - which I will probably do because the quality and depth of field I got from my old 50mm 1.4 lens is something that I'd like to have again. I've had this new camera for only a few short weeks - so I still have a lot of learning to do - but I'm slowing getting the hang of this new format. So far the hardest part is that this new camera lacks a viewfinder, which is something I loved about my DSLR. It makes up for it in some other areas though... with built-in wifi and a touchscreen - which are new and exciting to me! I'm excited to get to know this camera better and hopefully share my images here (fingers crossed, haha!). I sold my camera and lenses through MPB.com. They gave me a competitive quote the same day as my inquiry and set up an at-home pick-up through FedEx. All that I had to do was carefully package my equipment, they did the rest. After evaluation they paid me only a few short days later. If you're looking to sell your equipment, I highly recommend them!